Graduation day ceremonies are like cocktails. They are laced with cheer,happiness,high spirits and a tinge of nostalgia and sadness as well. It was a morning of mixed feelings on December 4, 2010, for the teachers of RV School and Mount Senoria. The nostalgia of happy memories and promise of new friendships, was what kept the cheer up. Touchstone, which began in May 2010 has been a journey of reflections, new learnings,reinventing attitudes and teaching learning practices. 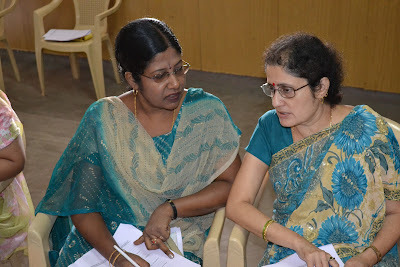 The Touchstone workshops focused on looking at teaching learning techniques in a new light and making the teachers 'experience' these learnings. The teachers brought into the workshops a range of classroom experiences,challenges and strategies and took back with them newer insights and innovative ways to assess students and learning. The classroom observation sessions(SBS), school and teacher portfolios and their presentations were some of the highlights of the Touchstone programme. A great way for us at TTF to see the teachers in action and reflection. 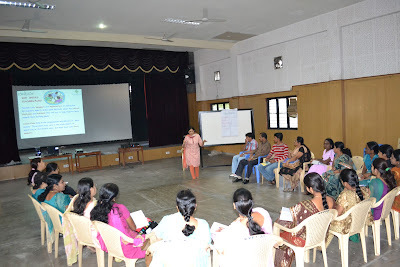 The completion certificates were a testimonial for an enthused and 100 % programme participation in spirit and presence,for all the teachers,who had undertaken the Touchstone journey. It was also time to applauded those teachers, who had displayed an ability to critique their own practises and beliefs,with the ' Touchstone certificate of merit '. A proud moment for all teachers indeed. A while later,the teachers took center stage,literally so. The skit on secularism brilliantly enacted by the Senorians and the lively medley of dances by RV School teachers along with some melodious numbers by both the schools just went to show that these teachers were dynamic performers even outside their classrooms. As boundaries of distance and schools were set aside,teachers took back with them new friendships and a bag of memories of some great times during workshops and breaks as well as the school observation sessions. The laughter and bonding,we can predict will continue to linger and stay with them for a long long time. We at The Teacher Foundation hope that these learnings and experiences will continue to inspire teachers to explore, experiment and innovate in their classrooms. Congratulations RV and Senoria teachers!